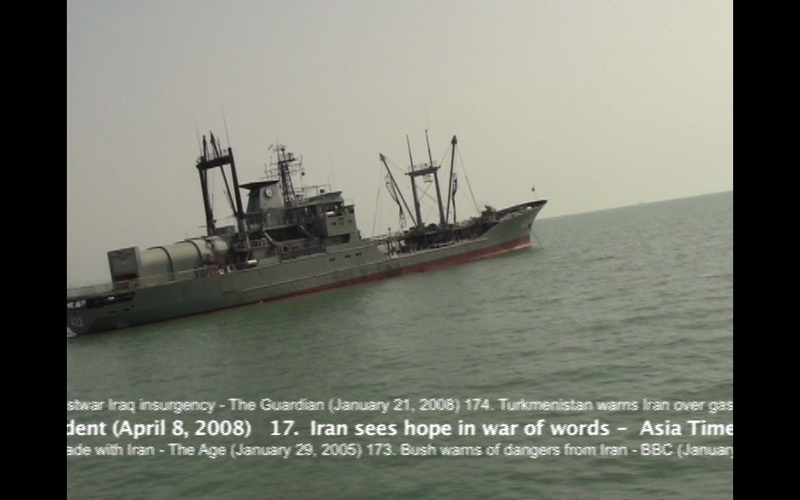 The video features naval amateur images from the Strait of Hormuz in The Persian Gulf and the news headlines referring to a hypothetical armed conflict with Iran. Daily shipping traffic resembles menacing naval maneuvers of a kind of “war games” that are played by real militaries. Sometimes it is difficult to discern virtual reality from the news, particularly when military drone operators are trained on video games, and they can go home for lunch in-between deadly missions; and the news are full of warnings and conjectures designed to influence public opinion rather than inform the public, in headlines such as “In Din Over Iran, Echoes of Recent Wars” (The New York Times, February 22, 2012).